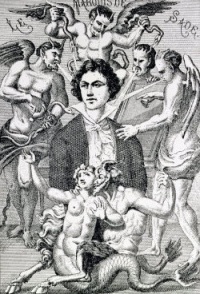 French writer Marquis de Sade (1740 – 1814) and Spanish painter Francisco Goya (1746 – 1828) were near-contemporaries. In The Tears of Eros Georges Bataille compares two near-contemporaries: French writer Marquis de Sade (1740 – 1814) and the Spanish painter Francisco Goya (1746 – 1828). Sade was locked up in prison for half of his adult life, Goya was locked inside his own body, locked in his deafness. Both applauded the advent of the French Revolution. Both abhorred state religion. Both were obsessed with pain, but unlike Sade, Goya "did not associate pain with sensuous pleasure" ("Goya n'associa pas, comme Sade, la douleur à la volupté") but his violence approximates eroticism. 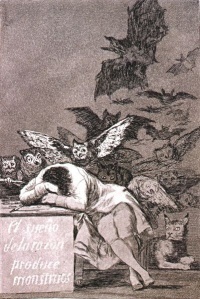 "For Sade as for Goya, unreason continues to watch by night; but in this vigil it joins with fresh powers. The non-being it once was now becomes the power to annihilate. Through Sade and Goya, the Western world received the possibility of transcending its reason in violence, and of recovering tragic experience beyond the promises of dialectic. After Sade and Goya, and since them, unreason has belonged to whatever is decisive, for the modern world, in any work of art: that is, whatever any work of art contains that is both murderous and constraining." Unless indicated otherwise, the text in this article is either based on Wikipedia article "Sade and Goya" or another language Wikipedia page thereof used under the terms of the GNU Free Documentation License; or on original research by Jahsonic and friends. See Art and Popular Culture's copyright notice. This page was last modified 19:37, 25 March 2014.